Last Friday, Governors Smoke Shop (@GovernorsSmokes on twitter), a relatively new shop in the Columbus area, hosted a large Drew Estate event. Our local sales rep Sam Smerkol was there holding down the fort, as well as special guest David Lafferty Regional Manager East Coast for Drew Estate. If you have met David before, you will know that fun and craziness follows this guy around. Video - Event: Drew Estate Mega Event - Governor Smoke Shop, Westerville Ohio - Cigar Explorer from Cigar Explorer on Vimeo. 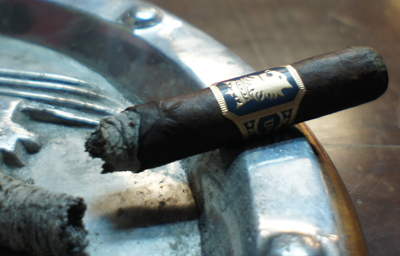 Undercrown has done very well and received much praise from the cigar blog world (if you want the whole story on how this cigar came about visit Tony's site here. It's got all the info you need and I won't need to repost it.) I've smoked well over a handful of Undercrowns, from samples at the tradeshow, to sticks from my B&M. Some I have liked, others I have not. Let's see how this new size held up. First off, I loved the size of this cigar. The classic Cuban corona size just really sat well in my hand and was a nice change from the big ring gauge cigars that seem to be dominating the market right now. The wrapper was a very dark brown color, almost black in some places, with a lot of oils that shimmered in the light. There were a few small veins but nothing that took away from the brilliant dark color. The pre-lit aroma had sweetness mixed in with some floral notes. The cap clipped easily and the cold draw tasted nutty and leathery. 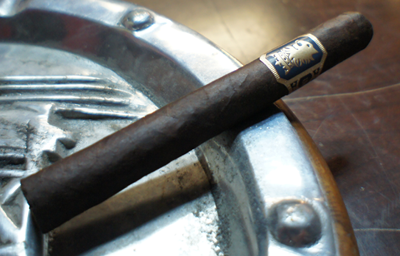 The first thing anyone smoking this cigar will notice right away is the amount of smoke this stick puts off. I've heard others say that Undercrown's "smolder". The Corona ¡Viva! is a perfect example of that. The resting smoke quickly filled the area of the lounge I was sitting in. The flavors in the first third were a little weak on the front with just some muted leather and sweetness, but the finish was powerful with lots of dry cocoa. There was almost no spice in the cigar at this point, which I found interesting because I remember some other Undercrowns having some. 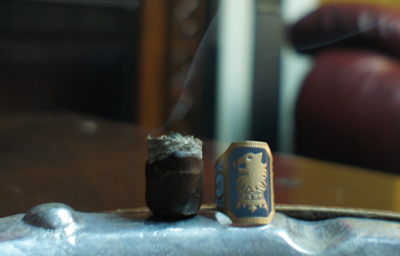 The construction was perfect and the cigar's burn created a nice tight, compact ash. I would put the strength of the cigar in the solid medium range. 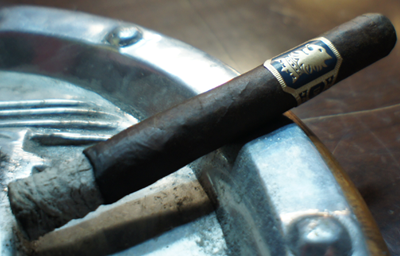 The second third of my Undercrown Corona ¡Viva! is where things started to really get interesting. And by interesting, I mean awesome. On the front of each draw, I was met with a very different sweet flavor that had a bit of a twang to it. I wracked my brain over and over about what this flavor could be and the best I could come up with is it was almost candy like. Not sickeningly sweet candy (this is tobacco we're talking about, after all) but twangy with almost some tartness. I know to my readers that might sound crazy/dumb, but it's the best way I can describe it. The finish flavor was still a strong dry cocoa which, even with its strength in flavor, it faded away nicely to leave my palate feeling clean. Still no sign of any problems with the construction or draw. Just like the first third, I would say the nicotine strength was in the medium range. 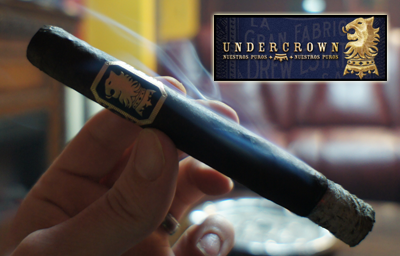 The final third of my Undercrown Corona ¡Viva! continued on like the second third, but only increased in flavor strength. Once again, the front of the profile was dominated by the sweet tangy flavor which actually started to creep into the finish as well. It did not overpower the cocoa taste, but it was in there. I burned this cigar as far as I could and I can honestly say that even with how much I love the size, I wished it was longer. I did notice that the nicotine strength started to pick up toward the end of the cigar and I could feel my heart rate pick up a bit, so I guess I would put the final third in the medium to medium-full range. Would I buy a box? This is for sure a box purchase cigar.